Gorgeous grey faux leather gives the Maxwell Dining Chair Grey a minimalist appearance that will be a welcome addition to any dining area. A modern chair simultaneously suitable for traditional decors, the marvellous Maxwell will not disappoint. 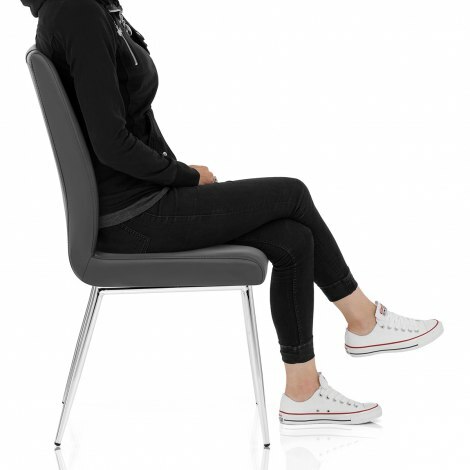 Densely padded for comfort, the seat and corresponding backrest are both ergonomically designed to contour to the body when seated for any length of time. 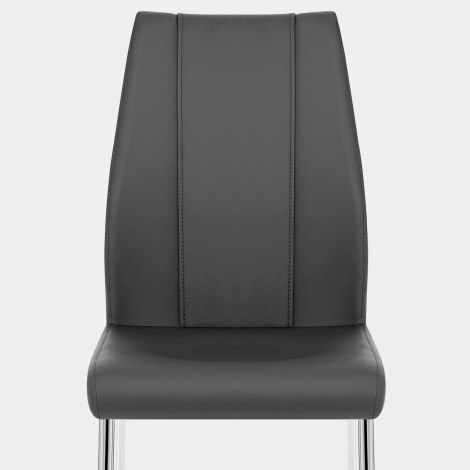 This includes the lightly curved backrest that further encompasses around the body for support and security. Stitched detailing also features on the backrest for a modern, decorative addition to the overall design. The frame below is a sturdy support for the seat, whilst the four chrome legs include protective plugs to help in the practical protection of your floors. "Great value. Very stylish. Very comfortable"
Product all as described and excellent quality, I also made a mistake with my first order and Atlantic shopping solved it extremely fast and resolved my order to my satisfaction definitely a five star service, many thanks. I’m honestly over the moon with this purchase, arrived next day, so easy to put together and great quality. I would highly recommend. Already bought 2 Maxwell chairs and decided we needed one more. Very good service and we love the chairs. My daughter told me to try this website as I was struggling to find 2 chairs for my new kitchen. There was lots of choice but I decided on the Maxwell chair and was very pleased I did. Easy to put together, lovely colour and perfectly fits in my new kitchen. Good value too and very quick delivery. Will recommend to friends. We purchased 2 of these chairs a couple of years ago and they are such good value and very comfortable we decided to order 2 more. So easy to put together too. Excellent value for money.